Binuclear antimony compounds with a bridging oxygen atom [Ph3SbOC(O)R]2O (R = CF2CF3, CF2CF2CF3), [(4-МеC6H4)3SbOC(O)CF2CF3]2O, [(3-FC6H4)3SbOC(O)R]2O (R = C6F5, CF2CF3) have been synthesized by reacting equimolar amounts of triarylantimony, carboxylic acid and tert-butyl hydroperoxide in diethyl ether. According to X-ray diffraction data, in the molecules of compounds obtained, the Sb atoms have a trigonal bipyramid coordination with carboxylate ligands and a bridging oxygen atom in axial positions. 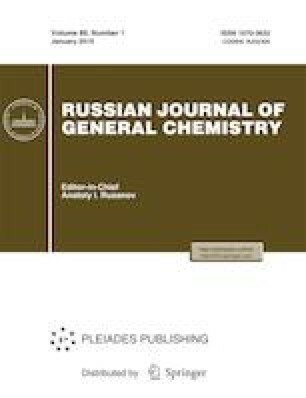 The intramolecular distances Sb···O with a carbonyl oxygen atom are less than the sum of the van der Waals radii of Sb and O by ~0.2–0.4 Å.
Russian Text © V.V. Sharutin, O.K. Sharutina, A.N. Efremov, E.V. Artem’eva, 2019, published in Zhurnal Obshchei Khimii, 2019, Vol. 89, No. 1, pp. 89–94.